Smiting The Mite To Save The Bees (And The Crops They Pollinate) : The Salt A government scientist says that to help keep more bees from dying we need to focus on helping beekeepers fight the varroa mite. But some groups say pesticides are just as problematic. 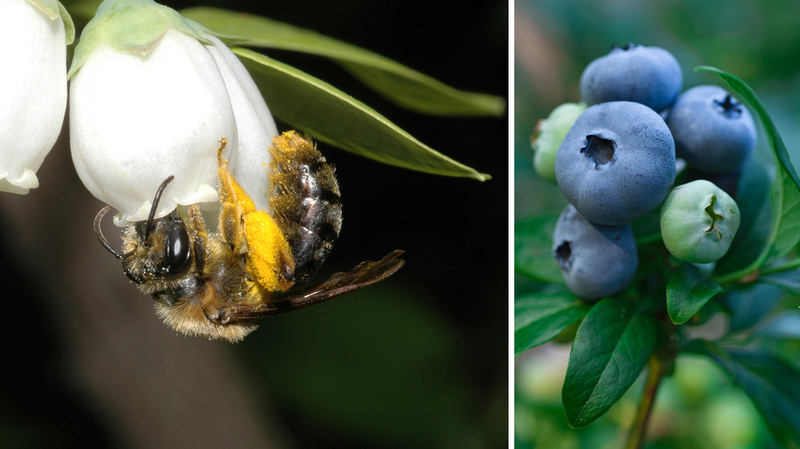 Wild bees, such as this Andrena bee visiting highbush blueberry flowers, play a key role in boosting crop yields. How do you like them apples, apricots, blueberries, almonds and peaches? They all depend on bees for pollination. But over the last several years, a massive number of bee colonies have died, putting beekeepers, farmers and scientists in a bit of a panic. They've come up with a lot of reasons why colonies are collapsing and dwindling. But on Tuesday, Jeff Pettis, research leader of the U.S. Department of Agriculture's Bee Research Laboratory, told a congressional subcommittee that there's one culprit that is almost certainly involved in the disaster. 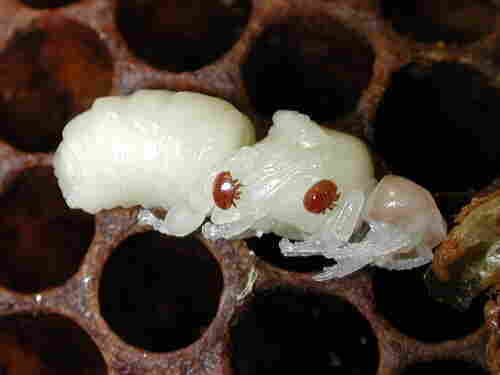 It's the varroa mite, a parasite that can weaken bees' immune system and infect them with viruses. His laboratory is now focused on fighting the mite. "The costs of mite controls and replacing hives ... are all accumulating to the point where varroa mites are making beekeeping no longer financially viable in this country," Pettis said. "The beekeeper's best hope is research that can build better tools to reduce the size of the varroa mite problem." Pettis says that those tools are now being created, thanks to some additional funding from Congress. And the President's FY 2015 budget proposes over $71 million for USDA alone to focus on the bees, he notes. But some environmental advocacy groups say Pettis and other key players who could determine the bees' fate didn't give enough attention at the hearing to another prime suspect: pesticides, especially a category of insecticides called neonicotinoids. "While some witnesses briefly addressed 'improper use' of pesticides for having detrimental impacts on pollinators, they failed to explain the full wealth of scientific knowledge on the subject," the Center for Food Safety said in a statement. "Neonicotinoids have been shown to weaken the immune systems of bees, which in turn exacerbates many of the other stressors the witnesses repeated pointed a finger to, such as the varroa mite and viruses." As NPR's Sam Sanders reported Friday, tens of thousands of bees in California mysteriously died after they pollinated almond farms. The Environmental Protection Agency is looking into whether pesticides are to blame.